WEATHERPROOF: Protective rain cover can be quickly deployed to keep your bag contents safe. 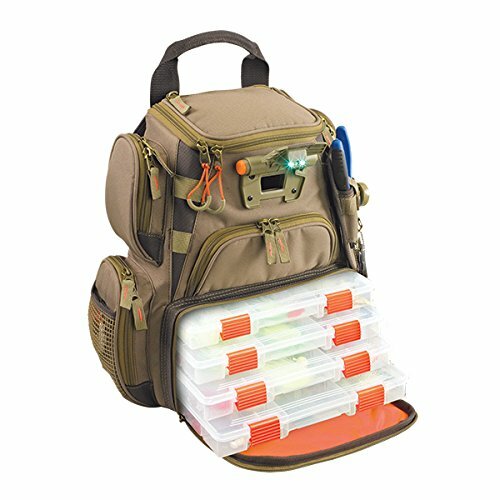 ORGANIZED: Mesh pockets for easy content viewing and clear internal pocket to keep your maps, licenses, and phone visible but dry. TRAY STORAGE: Storage of up to (4) 3500 style or (2) 3600 style trays to accommodate all of your storage needs. QUICK TOOL ACCESS: Removable pliers holder goes from bag to belt so your pliers are easy to find and removable self retracting steel cable lanyard for clippers or small tools. COMFORTABLE TO CARRY: Large adjustable padded shoulder straps.